Thanksgiving without eating turkey – unbelievable! The lengths this turkey goes to will keep you entertained. 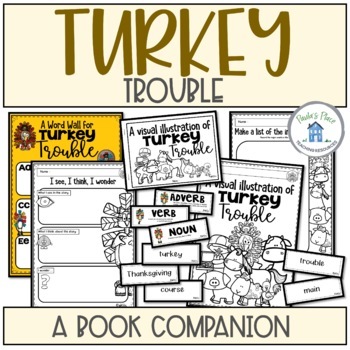 Study the text TURKEY TROUBLE and respond in a variety of ways with this huge variety of tasks to choose from. There are two versions for printing. 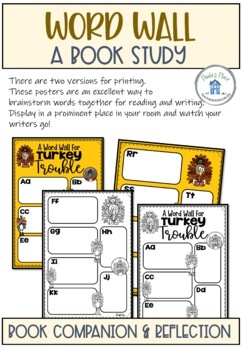 These posters are an excellent way to brainstorm words together for reading and writing. Display in a prominent place in your room and watch your writers go! This section includes a page for each costume change. Students can draw what they think about each change. As you read aloud stop before you show the illustrations from the book. Record a summary for each change. Then predict a new costume change. This sections includes a half page for each costume change. Students can draw what they think each costume is like. 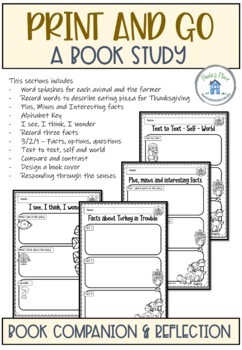 There is space for your students to record a description for each change. These make great books to put in your reading corner. 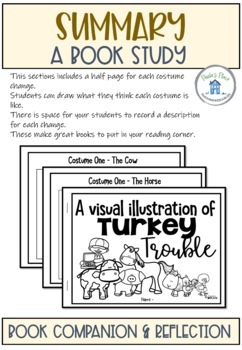 The Book Review templates allow for illustrations and a text response. The first page is great for setting up beginning, middle and ending so that the second page is easier to complete. Author tools – what does the author do to keep us reading and interested? ♥ Please go to your My Purchases page (you may need to login). Simply click it and you will be taken to a page where you can give a quick rating and leave a short comment for our product.